Unlike the other paths that start along Ross Maxwell Scenic Drive in Big Bend National Park, including the routes to Blue Creek Canyon, Ward Spring and Upper Burro Mesa Pouroff, the Apache Canyon Trail is not signposted and has no parking area; although maintained and relatively easy to follow, the trail is not promoted by the NPS, because it leads to a historically sensitive area that includes two early 20th century stone ruins and evidence of much older civilization in the form of stone quarries and occasional projectile points. The people who first settled here were from the Clovis Culture around 12,000 years ago, and two factors made this location favorable; a permanent spring, and a large outcrop of hard crystalline rock (novaculite), suitable for fashioning into tools, and it is the exposed rocks, which exhibit a range of unexpectedly bright colors, which are the most visible attraction of the hike. 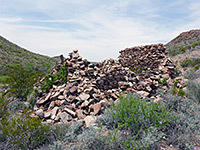 The trail is fairly level, though rather long and exposed, as it crosses the grassy top of Burro Mesa, then slowly descends into a wide drainage, where the ruins of a corral and house are evidence of ranching operations prior to the national park creation. The path seems to end at the corral, but a short off-trail hike along another branch of the valley and over a low divide reaches the rock formations, at the upper end of the adjacent drainage of Apache Canyon. The rocks are easiest viewed from above, on the canyon rim, though it is not too difficult to descend into the canyon and explore further; the spring is half a mile downstream. 12 views along the trail. The unmarked parking place for the Apache Canyon hike, on Ross Maxwell Scenic Drive, is 1.3 miles south of Oak Spring Road and 0.9 miles north of the Ward Spring pull out - where the road crosses the gravelly streambed of Cottonwood Creek, there are wide verges with space for a dozen or so vehicles. Plentiful tire marks suggest the trail is still regularly hiked, despite not being publicized. 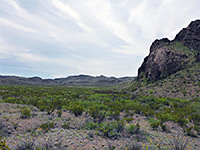 At the parking area, the land to the east is open, allowing long, unobstructed views to the Chisos Mountains and north across extensive desert plains, while to the west, the ground rises 200 feet to the edge of Burro Mesa. The hike begins up the bush- and tree-lined streambed of Cottonwood Creek for 200 feet, where a cairn marks the start of the path, on the west side. More cairns indicate the course of the trail, through bushes and up a gentle slope beside a minor tributary wash, becoming briefly quite steep, and covered with loose stones, to a saddle at the rim of the mesa, location of a trail register and (free) permit slips. Ahead, the terrain is rather featureless, consisting of undulating hills and valleys with very little large vegetation. The course of the trail is evident quite a long way ahead; it descends into a low basin, crosses a couple of dry washes, rises again to a minor saddle on the far side then traverses a similar, slightly more elongated basin, up to the next ridge. Wildflowers are limited but cacti are plentiful, some of the more unusual species being echinocereus chloranthus, echinocereus viridiflorus, glandulicactus uncinatus and escobaria tuberculosa. The next section of trail runs along the crest of a wide, gently sloping ridge, as several peaks and deeper ravines become visible in the distance. After passing another minor high point, the path moves down into the upper end of a shallow valley, centered on a bushy streambed; it starts on the south side of the drainage then crosses to the north, rounding the end of a reddish ridge and continuing northwest. The valley is now very broad, with a floor of dried mud dotted with closely-spaced bushes, but it becomes narrower not far ahead, as two rounded summits rise at either side. 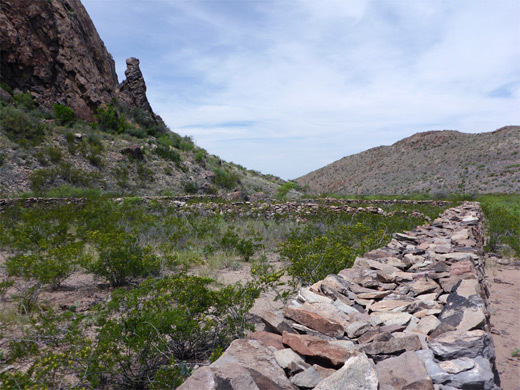 The path crosses to the far side of the streamway and comes close to the westernmost peak, at the base of which is a well preserved stone corral, 150 by 90 feet in size. The walls are 3 feet thick and up to 4 feet tall, and the structure is visible for some distance back along the trail, which continues for a hundred feet or so close to another wash, then appears to end. Two hundred feet beyond, a little way up the hillside, are the remains of a stone cabin; a window and doorway are recognizable, though most of the structure has collapsed. The cabin and the corral were associated with Sam Neil Ranch, the main part of which is along the scenic drive a few miles east. 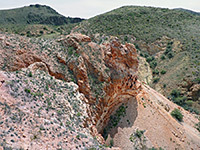 The cabin overlooks a fork in the valley - further downstream (west) this deepens and after a mile leads to a geologically interesting area where features include narrows, a dryfall, and patches of exposed red and white rocks, but the route to Apache Canyon is northeast, up the other fork of the drainage containing the ruins. This streamway can be followed a short distance until it becomes blocked by thorny bushes, after which the easiest route is about 40 feet up hillside on the west side, where the vegetation is much less. The land ahead seems uninteresting at first, but the exposed rocks lining the upper end of Apache Canyon come into view after a third of a mile, once over a low divide. There are two main colorful areas, an initial, 400 foot-long ravine which is deep pink and red on one side, more muted on the other, and a larger basin beyond, richly colored on both sides, and sheer-walled to the south. The canyon floor is 200 feet below, reachable most easily by entering the very southern end of the drainage; if following the east rim, above the exposed rocks, the land is generally too steep to descend until a half a mile or so. White terraces near the rim of the canyon are home to many cacti, including the rare epithelantha micromeris (button cactus). 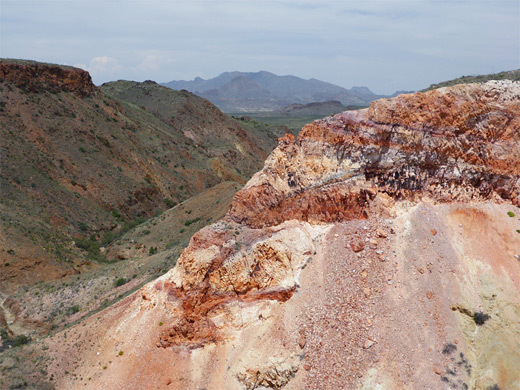 The exposed reddish rocks are novaculite, a variety of flint, here colored variously white, red, orange and pink, with some bands of very dark purple. The material is very hard, and fractures with razor-sharp edges, hence it has a long history of use in fashioning tools and weapon points.